Context - In recent years, sales of personal music players have soared, in particular those of MP3 players. Music from such players has become a significant threat to hearing because it can reach very high volumes and because an increasing proportion of the population is exposed to it, particularly young people. Overall, in the EU, roughly 50 to 100 million people listen to personal music players on a daily basis. In the light of current scientific knowledge, can the use of personal music players damage hearing? 1.1 It is well recognised that long-term exposure to excessive sound can harm hearing. To protect workers, limits have been set for the levels of noise allowed in the workplace. Environmental sounds to which the general public is exposed - such as noise from traffic, construction, aircrafts or from the neighbourhood - can be very irritating but are in most cases not loud enough to harm hearing. 2.1 When exposed to sound, ears perceive tiny changes in pressure. This sound pressure level can be measured and is commonly expressed in decibels (dB). An average human starts to hear sounds at a certain level that has arbitrarily been defined as 0 decibel. When sound increases by 20 dB, it represents a 10-fold increase in sound pressure. For instance, the sound pressure of an aircraft taking off nearby (120 dB) is 1000 times greater than that of a normal conversation (60 dB). Limits have been set to protect workers from excessive noise. The risk for hearing damage depends on sound level and exposure time. For long-term exposure of workers, a working day of 8 hours is typically considered in order to set protections standards. Because sound levels vary in time and from worker to worker, protection standards are expressed as an equivalent continuous sound level that would contain the same amount of energy as the sounds heard. The EU has established a series of exposure levels above which action should be taken to protect workers. A minimal action level of hearing protection has been set at 80 dB(A) for an 8-hour working day, assuming that below this level the risk to hearing is negligible. This sound level is roughly equivalent to someone shouting or traffic noise from a nearby road. So far, limits have only been set to protect workers from excessive noise exposure and not for other situations such as the use of personal music players with headphones. The limits are nonetheless relevant to other situations where sound can have harmful effects. 4.1 One of the most common forms of hearing impairment is hearing loss, which is the inability of the affected individual to hear sounds below certain thresholds. This can be measured with standard hearing tests. Certain people with normal hearing thresholds can nonetheless have problems understanding speech due to difficulties in processing sounds. 6.2 Some individuals are more vulnerable to excessive sound exposure than others due to genetic or environmental factors. For instance, exposure to loud sounds in combination with other exposures to chemical substances such as heavy metals and organic solvents, or to vibrations may lead to more severe hearing damage than would be expected from sound exposure alone. Personal music players (and mobile phones with such functions) are not only used to listen to music or to radio programs, but also increasingly to watch videos and pictures or store files. With the digital formats of sound currently available such as MP3 files, it is possible to reach high sound volumes without quality loss. 8.1 Most users of personal music players choose sound volume settings which are unlikely to cause hearing loss. However, some young people set the volume control very high or listen to music through personal music players for many hours per day, thus risking hearing damage in the long term. Exposure to disturbing sounds can have psychological effects. For instance, it can hamper reading, memory, motivation and attention. Short-term exposure to disturbing sounds, such as road and aircraft noise, affects reading skills and memory. Even if no research so far has determined that the same is true for exposure to music, there is no reason to assume that it should be less harmful to the ability to read and memorise than aircraft, road traffic or speech noise. 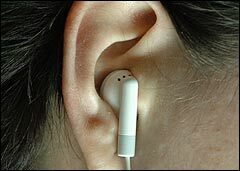 Listening to music from personal music players while trying to read a text is thus expected to affect how well the text is remembered and how much is learnt from it. Long-term exposure to continual aircraft noise somewhat affects the ability of children to concentrate and learn. However, there is not enough evidence to conclude whether listening to music through personal music players has any similar long-lasting effect. Listening to music through personal music players can be beneficial when performing boring and repetitive tasks; however, it may be a hindrance for complicated tasks that require thinking. Music can distract the listeners and isolate them from their environment which can be very dangerous when driving or walking on busy roads.